Above times are Eastern Standard Time (GMT -5). Click each time to see it in your time zone. Times may vary by a few minutes due to varying set lengths. It all starts Saturday, November 17 at 6:00 AM Eastern / 3:00 AM Pacific / Noon CET! There will be a two hour break for DESTINATION:trance with Ant Attwood, Phil A, and guest Jer Martin at 12:00 PM Eastern, however the D.U.T.C.H. 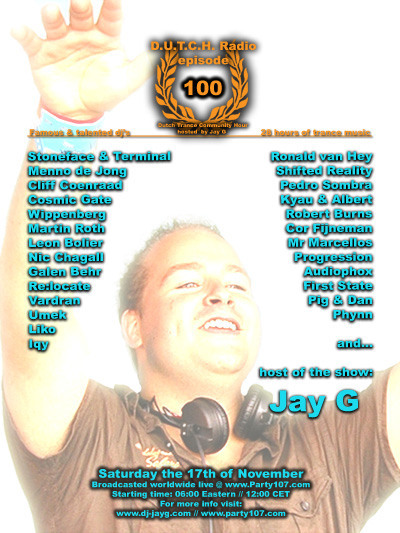 100 special will resume at 2:00 PM Eastern / 20:00 CET and continue through Sunday morning.